Enjoy the best inspirational, motivational, positive, funny and famous quotes by Allan F. Packer. Use words and picture quotations to push forward and inspire you keep going in life! 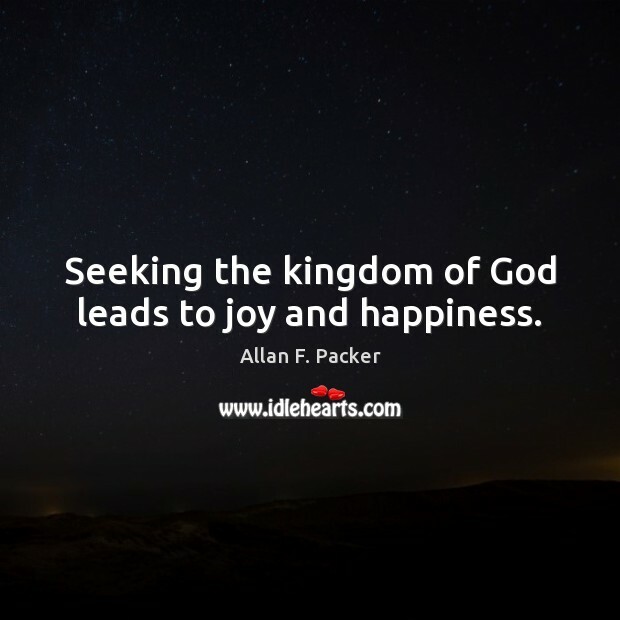 Seeking the kingdom of God leads to joy and happiness. At the beginning of each chapter, a heading tells us about what is happening in the chapter. We can ask, "What was going on here? What was this person feeling?" When we take time to look more closely at the scriptures, we can better understand what they can teach us. This will build our self-confidence and our testimony. 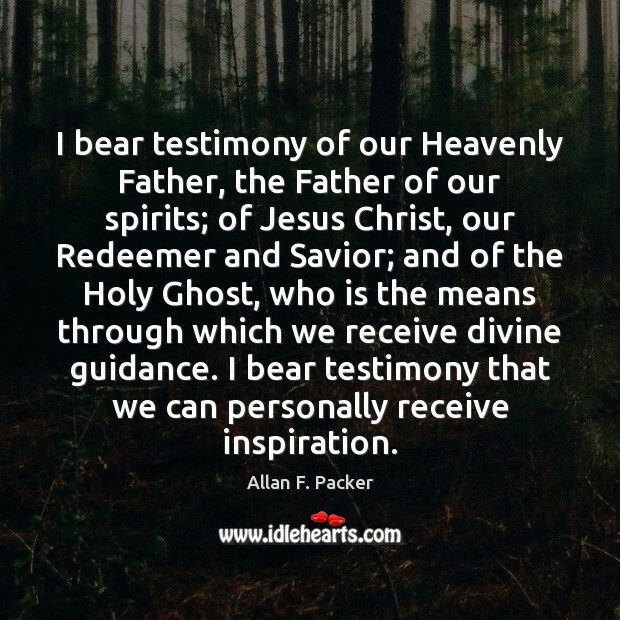 I bear testimony of our Heavenly Father, the Father of our spirits; of Jesus Christ, our Redeemer and Savior; and of the Holy Ghost, who is the means through which we receive divine guidance. I bear testimony that we can personally receive inspiration. When the winds blow and the rains pour, they blow and pour on all. Those who have built their foundations on bedrock rather than sand survive the storms. 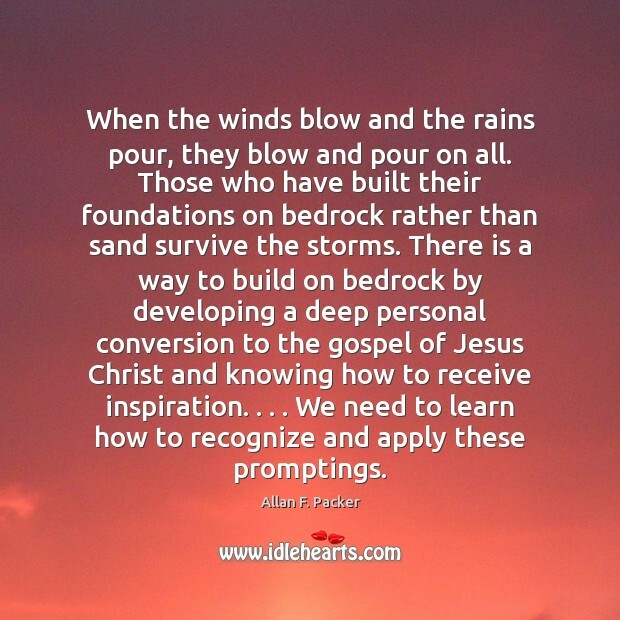 There is a way to build on bedrock by developing a deep personal conversion to the gospel of Jesus Christ and knowing how to receive inspiration. . . . We need to learn how to recognize and apply these promptings. Our Heavenly Father is the Father of our spirits, and Jesus Christ is the Creator of this world. They know and understand us and the world around us better than anyone else. Looking to a higher source for knowledge and power can help us far more than relying on the wisdom of the world. 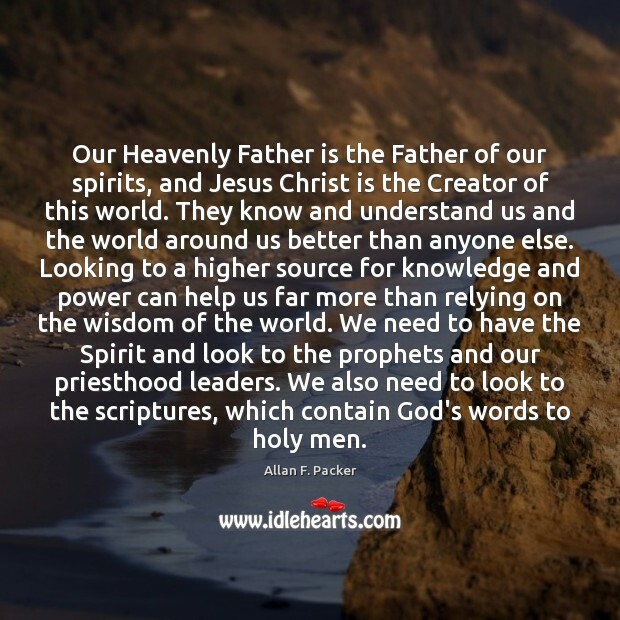 We need to have the Spirit and look to the prophets and our priesthood leaders. We also need to look to the scriptures, which contain God's words to holy men. I have found it helpful to say a prayer asking to understand the scriptures when I read them. 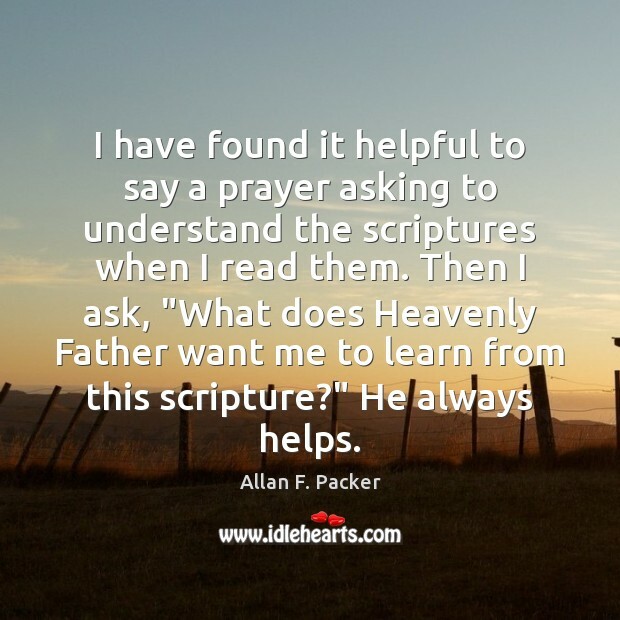 Then I ask, "What does Heavenly Father want me to learn from this scripture?" He always helps. 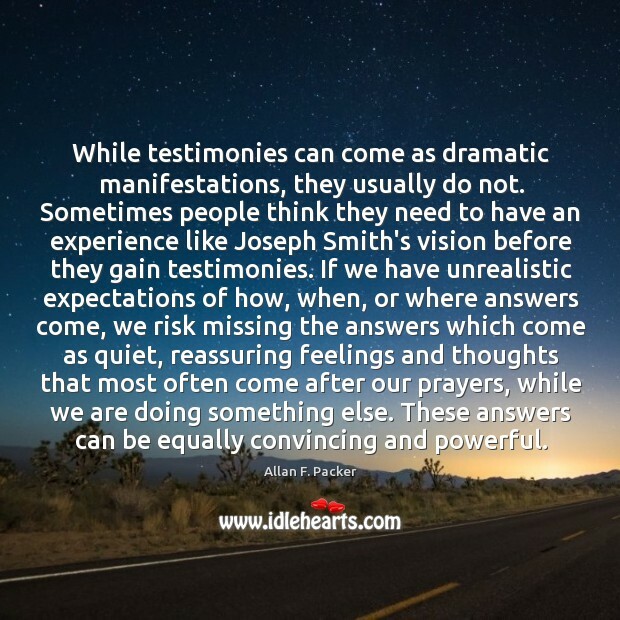 While testimonies can come as dramatic manifestations, they usually do not. Sometimes people think they need to have an experience like Joseph Smith's vision before they gain testimonies. If we have unrealistic expectations of how, when, or where answers come, we risk missing the answers which come as quiet, reassuring feelings and thoughts that most often come after our prayers, while we are doing something else. These answers can be equally convincing and powerful. 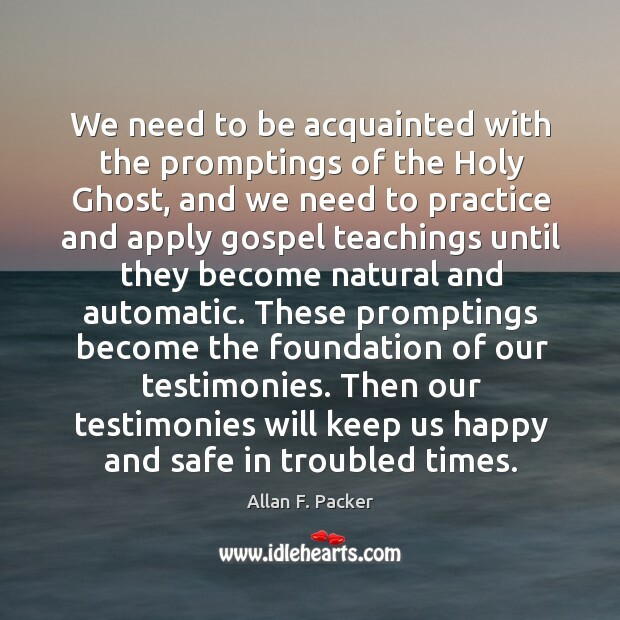 We need to be acquainted with the promptings of the Holy Ghost, and we need to practice and apply gospel teachings until they become natural and automatic. 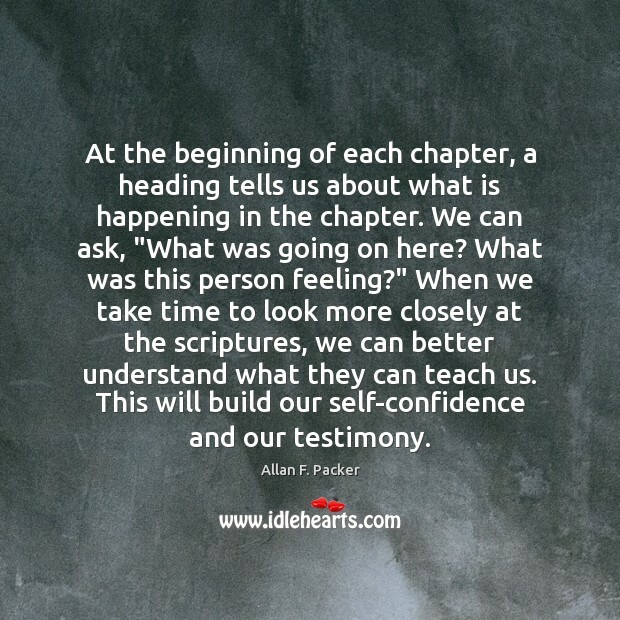 These promptings become the foundation of our testimonies. Then our testimonies will keep us happy and safe in troubled times.